Green spray pattern indicator further reduces golfer awareness of applications compared to blue colorants. Waterproof, foil-lined SoluPak prevents accidental staining. 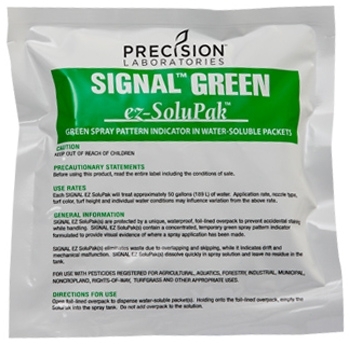 Each Signal Green EZ SoluPak will effectively treat approximately 50 gallons of water. Application rate, nozzle type, turf color, turf height and individual water conditions may influence variations from the above rate.